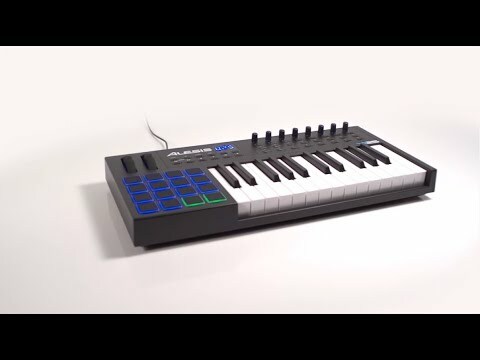 The Alesis VI25 is a new USB MIDI controller, that promises control over your DAW as well as your plug-ins. Alesis is a brand that tends to pack a big, feature-packed punch when it comes to its music tech gear, and from the outset, its pretty clear that the VI25 is no exception. This is a compact, 25-note controller design. The keys are full-size, and semi-weighted, meaning that they shouldn’t prove too jarring for anyone who is used to playing a piano. The keys are also velocity sensitive, meaning that any dynamics (how hard, or how softly you hit the keys) will be transmitted to the host computer and software. The keyboard also features aftertouch. An octave button is equipped, meaning that the note range can be shifted upwards or downwards by octave increments. Perhaps the VI25’s most distinctive feature lies to the left of the keyboard. Here, a 4 x 4 grid of trigger buttons is fitted. These are both velocity and pressure sensitive, making them are superb, expressive means of programming drum parts, samples, or a huge variety of other MIDI duties. The buttons also feature RGB backlighting, adding an excellent means of providing visual feedback about the virtual devices being controlled. Across the top of the VI25, there are eight assignable knobs, with illuminated ‘halo’ indicators, each with three assignable buttons below. This array of controllers provides a very versatile set of tools to gain hands-on control over plug-ins or a DAW mixer. Though these are typically very easy to assign from within DAW software, Alesis has also included a dedicated MIDI editor with the package, which allows bespoke MIDI maps to be created, saved and loaded with ease. Next to the bank of controllers is an LCD display, which shows keyboard parameter data, along with transport controls and navigation buttons. A pitch-bend and modulation wheel completes the arsenal of controls. A sustain pedal input is also fitted to the rear, along with a MIDI out, for connecting the keyboard to sound modules or other MIDI gear. The Alesis VI25 is an incredibly well specified controller, well suited to all manner of musical situations, and compatible with both Mac and PC.